I'm in high spirits today. Exams are finally here and will be over in a few hours. Whoop! 1. The Tail comb Terrorists:- These ones walk around the salon brandishing tail combs, ready to tear any strands in sight. Of all the hair crimes they commit with this weapon, the worst has to be when they use it to touch up your relaxer. 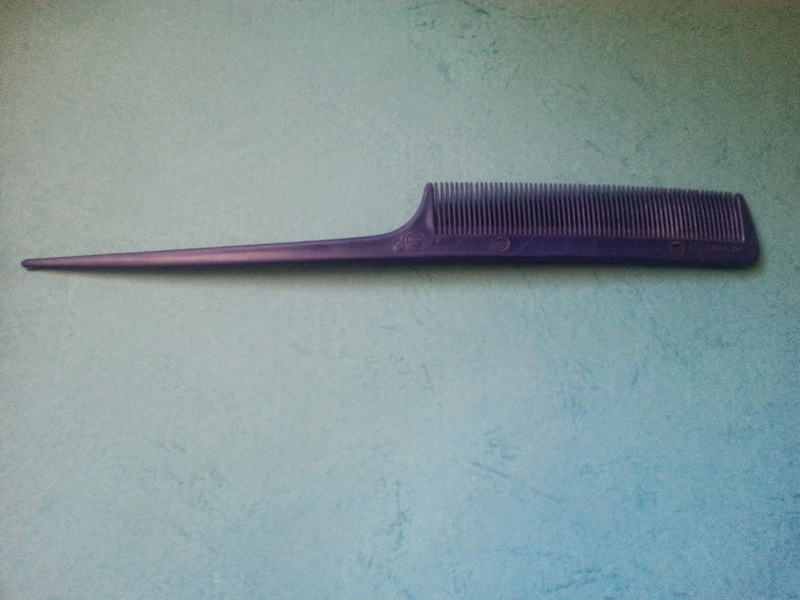 The amount of hair I lost to this comb in my pre-hair journey days... I weep. When they grudgingly agree to use a wide tooth comb, they go right to the roots and PULL. But big girls don't cry. 2. The Straightener Soldiers:- I can't count how many times I've been urged to flat iron my leave-out hair when I get a weave installed. "Aunty it will be fine, true! It will be smooth", then he/she proceeds to come at me with a SMOKING flat iron. On whose hair?? No thanks! The part I don't understand is that the weaves are hardly ever even straight. Wavy, curly, whatever- the hissing straighteners are never far away. 3. The Relaxer Radicals:- my scalp is super sensitive, my hair gets processed veery quickly. From my very first relaxer it's been about speed, speed, speed. I tell the stylist before I sit down, again when I bring out the relaxer box, yet again just before they start applying it. So imagine my frustration (and this happens consistently) when sista takes her time, only to have my scalp burning in the back before she's even started on the front sections. And this is after basing my scalp heavily with vaseline and using a kids' relaxer. You see why I want to go natural? On top of this, they want you to sit and wait so that the hair will "sleep" ie fry. 4. The Dangerous "Experts":- They know your hair better than you do. The last time I was in a salon (3 months ago), I went to have a weave put in. The salon in lekki phase 1 shall remain nameless in this post. This particular hair dresser was a multi-talented hair criminal. First, she was a tail comb terrorist. I promptly banned all combs within a 5-mile radius. I brought out my own wide-tooth comb and she used it against me: pulled from the roots. I yelped, she apologised (bless her) and then said it was because my hair was "due". Yes my hair was about 10 weeks post relaxer but that's small potatoes for me. I routinely go 6 months without. I told her as much and here was her reply :"Ah! No no no, it's too much o, your hair will fall out!" Pause. My hair was past mid-back length, long and full. Hers was not "due", it was limp and uneven. The fact that it was short wasn't the problem- any length is great as long as it's healthy. This was not. She really was in no position to give hair advice. I had to go: "Really?! Have you seen my hair?" Then I felt bad and spent the rest of the session being very nice. She asked what I do to my hair and I gave her some pointers. I hope she uses them. She did a really good job with the weave so it wasn't an all-bad experience. A wince here, an ouch there, nothing I couldn't bear with gritted teeth. I got 3 weeks out of that protective style- really good. 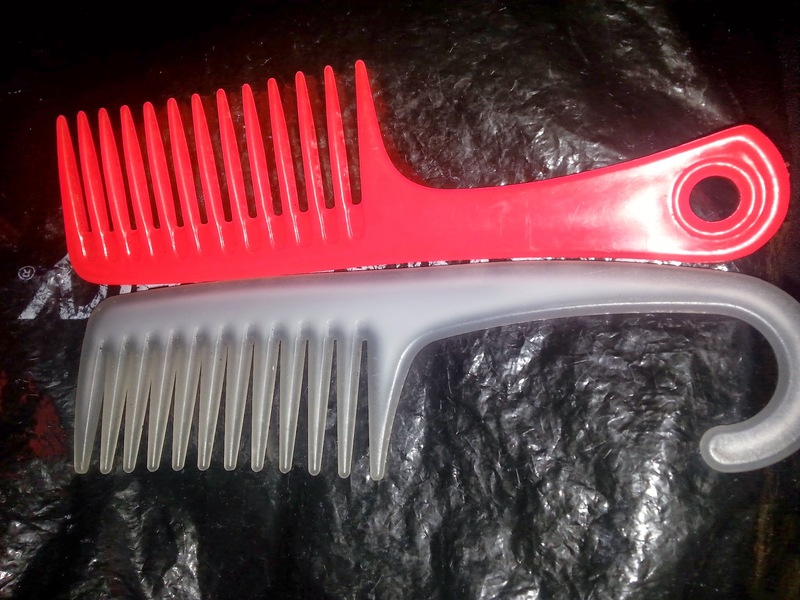 The clear one is my Conair shower comb- detangling since '02. The red I got at Ebeano supermarket in Phase 1. I don't know what brand it is, it just has 888 inscribed. 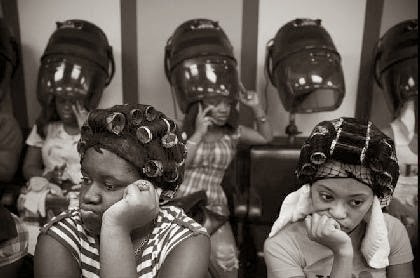 What has been your experience with hair dressers in Nigeria? Any you would recommend? Any hair crimes committed? Hi Love, I can relate to every single thing in this comment! Changing salons doesn't even help, it's the same recycled stylists passing down the same crappy techniques. DIY at home it is for me too. Me and rat tail terrorists!! It made small sense with my relaxed hair (yes, it wasn't healthy but the combs could still comb something) but with natural hair, can't they feel the tension? The way the hair is refusing it, especially as they don't detangle with a brush or bigger comb first? So crazy! Got my hair braided last week and I succeeded in making the braider substitute the tail comb for her fingers. She still managed to make my scalp sore, but the fact that she listened to me and finger detangled, has kind of won me over. We have a long way to go, but I will go back to her. Hopefully when we're done, she'll transfer the lessons learnt to heads she'll handle in the future. I was happy to chop my hair off after primary school (I was starting boarding school) because salon visits always came with tears! Now I have mouth to talk but I'm happy to do my own hair now. I hope to be self-sufficient in the long run. Lol sister bless your soul jare. I just tire for naija salon.......i wish i have an alternative. My last relaxer was early November last year and that was after my 8 months first stretch. I had to prepare my hair very well for the ordeal, and one of the things i need was to base my scalp and root with oil. You tell them to relax only the new growth.....Mba, they enjoy relaxing the already relaxed part. And when you try to educate them; you are on your own (O.Y.O), they are not interested. They're selfish indeed, imaging saying I have to stretch my hair after relaxing (of course for an exter fee) or else it'll become "due" again I mean really? And the ones that leave the conditioner in for just long enough to pick up the comb and start combing your dripping wet hair with so much force they almost snap your neck. And the ones that never bother to properly wash off the relaxer at your nape. You tell them, my neck area is burning, you haven't washed it properly and they reply "aunty it's just because your neck is at the edge, it's the wash basin that's paining you". And the ones with the evil scissors to trim flyaway hairs after braiding that leaves your hair ragged when you loosen it. When you tell them no trimming, they'll reply that you're making their handwork look bad.. Sorry for the long episode..
Lol... not at all. these people give us a lot to rant about. That trimming bit made me wince. I hate when they do that! I was like what sleep.....the hair and scalp has been murdered! The lady had extensive relaxer burns.....and still she sat down for blowdrying.....smh.......what gives??? I've been a victim to all these different kinds of hair terrorists. My worst experience was in December of 2010, I had relaxed my hair maybe three months before, and I was a bridesmaid at a wedding, so I decided to get my hair relaxed and styled instead of putting in a weave immediately after relaxing. Come and see the hairdresser pulling at the hair that she had doused with relaxer like 30-40 mins before (way too long). She was now angry because I insisted on her washing it off before she thought it was ready. She pulled out clumps of hair from my head and no amount of complaining and pain could stop her. I told her I was loosing too much hair to the comb, and her annoying response was that the hair that was falling out was weak anyways and needed to go. I was so pissed! I was even more angry when after she styled my hair, I discovered an almost bald spot right in the middle of my scalp!!! I swore never again. Since then all my relaxers have been DIY. Ahh! She gave you a bald spot! This particular one needs to be locked up and taught a thing or two, or she should find another vocation.